By the time Jigmastas were formed in 1991, hip hop had come a long way from the genre was born in the Bronx in the late sixties. Its founding fathers were groups of African American and Latin American youths. This includes the Ghetto Brothers. They plugged the amplifiers for their instruments into the lampposts on 163rd Street and Prospect Avenue. Soon, music was being cranked out of their speakers. However, this was no ordinary music. The music the Ghetto Brothers played was credited with breaking down racial barriers. It also had a social conscience. The Ghetto Brothers were involved with Puerto Rican independence, and the nascent Puerto Rican Socialist Party. Like future hip hoppers, they were determined to make a difference, and used their music to do so. Despite the importance of the music the Ghetto Brothers played, they only released one album Ghetto Brothers-Power-Fuerza in 1971. It’s become part of musical history. So have DJ Kool Herc’s block parties. They took place at 1520 Sedgwick Avenue. At these parties, DJ Kool Herc sampled parts of records, looped breaks and added his imitable “shouts.” This was the equivalent to Jamaican DJs toasting. Nobody had ever done this before. It was a first. Modern hip hop was born, and DJ Kool Herc was its founding father. However, it was Afrika Bambaataa, who was of the Zulu Nation collective that identified the four key elements of hip hop. That was the DJs role. MCing or rapping saw the MC rap or chant rhyming lyrics. B-boying was the breakdancing that accompanied the music. Graffiti art was either writing or drawing that were illegally painted on a public place. This was the art of hip hop. Having identified the key components of hip hop and gone onto become one of the progenitors of breakbeat DJing, Afrika Bambaataa was about to join hip hop’s nascent hall of fame. While Eric B. and Rakim’s Paid in Full was released in 1987, on one of Def Jam’s competitors, 1988 proved to be a good year for Rick Rubin’s label. Def Jam released Slick Rick’s The Great Adventures of Slick Rick. Public Enemy’s seminal album It Takes a Nation of Millions to Hold Us Back. Full of social comment, It Takes a Nation of Millions to Hold Us Back sold a million copies in America alone. The album is now considered a hip hop classic. So would an album released by in another of Def Jam’s competitors. It’s documented on Jigmastas’ Grassroots The Prologue Deluxe Edition which will be released by BBE Music on 18th September 2015. This twenty-one track compilation documents part of Jigmastas’ twenty year recording career. Most of the tracks on Grassroots The Prologue Deluxe Edition are singles and non album tracks. They’re part of the Jigmastas story, which began in 1995. Back in 1995, Jigmastas were making waves. A&R executives were constantly searching for hip hop’s next big thing. Some A&R executives thought Jigmastas were the future of hip hop. Especially, after they featured on Rude Rydims’ single underground hit Everybody Bounce. This brought Jigmastas to the attention of major labels. They knew hip hop was big money. That’s despite the change in hip hop. By 1995, the music had a much tougher edge. It proved an equally controversial album. Described as G-Funk, it glorified the use of guns, alcohol, and marijuana. According to purveyors of G-Funk, this solved any problem. While three million people bought The Chronic, politicians and the album’s critics weren’t impressed by what was among the most explicit gangsta rap ever released. However, this was just the start. The Chronic proved that what was explicit gangsta rap could prove commercially successful. After the success of The Chronic, West Coast gangsta rap came to dominate rap, and Death Row Records which released The Chronic, would become one of the most successful hip hop labels. By then, hip hop was changing, and looking to its past. There was a resurgence in interest of Mafioso rap, after the release of Raekwon’s debut album Only Built 4 Cuban Linx…in August 1995. Then in October 1995, Nas released Doe or Die. This pseudo Mafioso rap continued the glorification of the criminal lifestyle. To some extent, it was playing out before hip hoppers eyes. That was Jigmastas. Although they had interested major labels, DJ Spinna and Kriminul decided to found their own label, They called this new label Beyond Real Recordings. It had been inspired by a track Jigmastas had just recorded. Jigmastas decided that this would become their debut single Beyond Real. On the flip side, was Dead Man’s Walk. Both tracks feature on Grassroots The Prologue Deluxe Edition which will be released by BBE Music. What was Jigmastas gave them a minor underground hit, However, it was the last single Jigmastas released until 1998. After two long years, Jigmastas returned with their new single Hip Hop. It was released on their own label Beyond Real Recordings. Hip Hop, which was produced by DJ Spinna features on Grassroots The Prologue Deluxe Edition. So does a remix of Beyond Mix. However, after the releae of Hip Hop, Jigmastas released a single on one of hip hop’s biggest labels. Later in 1998, Soul Scream and Jigmastas released an E.P. in Japan. Soul Scream’s contribute was Vibe, while Jigmastas released the original and instrumental version of All Day. For Jigmastas, that was the story of 1998. 1999 would prove just productive. During 1999, Jigmastas released another three singles. This included an E.P, with Defari. They both contributed three tracks. Jigmastas’ contribution was three versions of Let Me Hear It. Along with three version of Defari’s Blast, they were released on Tommy Boy’s Black Label imprint. After that, Jigmastas returned home to Beyond Real Recordings. Chandon was one of two singles Jigmastas released on Beyond Real Recordings. On the flip side was Iz You Dee. Both the original and remix of Iz You Dee join Chandon on The Prologue-Deluxe Edition. So does if, an E.P. which featured Jigmastas and the then unsigned I.G. Off and Hazadous. Jigmastas contribution If, also features on Grassroots The Prologue Deluxe Edition. By then, Jigmastas’ music had a much more laid-back, mellow vibe. However, that would change with their next release. As a new millennia dawned, Jigmastas were planning on releasing an all-star collaboration. This was their Lyrical Fluctuation E.P. Mos Def, Mr Complex, Pharoahe Monch, Shabaam Sahdeeq and Talib Kweli all featured on the Lyrical Fluctuation E.P. Two tracks. from the Lyrical Fluctuation E.P.,the Original Mix and 2000 Spinna Mix feature on Grassroots The Prologue Deluxe Edition. Both tracks have a much tougher sound than Chandon and Iz You Dee. It seemed Jigmastas’ sound was constantly evolving. That became apparent when Jigmastas released a compilation album Grass Roots “Lyrical Fluctuation” in 2000. Over ten tracks Jigmastas showcase their musical prowess. That’s the case from Intro through Across The Globe. It features twice on Grassroots The Prologue Deluxe Edition. 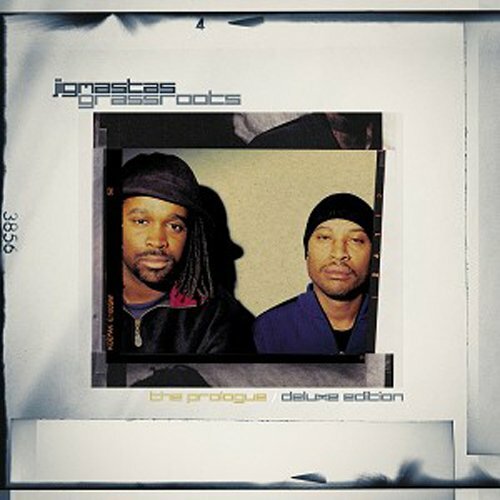 The other version on Grassroots The Prologue Deluxe Edition is the Joc Max remix, From Across The Globe, Jigmastas Keep On Rockin before dropping the Joc Max produced Matrimony. Jigmastas aren’t finished yet. Awareness, Thief’s Theme and Outro conitune to showcase the skills and versatility of Jigmastas. Each of these tracks feature on Grassroots The Prologue Deluxe Edition. So does the remix of Iz Dee and the Original Mix and 2000 Spinna Mix of Lyrical Fluctuation. Essentially, the entire Grass Roots “Lyrical Fluctuation” album features on Grassroots The Prologue Deluxe Edition. It was released in 2000, which had been Jigmastas’ busiest, and most productive year. 2003 saw things slow down for Jigmastas. They released On The Strength on the Las Vegas label HipHopSite.com Recordings. That was the last we heard of Jigmastas until recently. After releasing their debut album in 2001, Jigmastas released So What as a single in 2002. It was released on Beyond Real Recordings, and features on Grassroots The Prologue Deluxe Edition. On 14th August 2015, Jigmastas dropped a new single Magnetize. It was released on Beyond Real Recordings, just in time for the release of Grassroots The Prologue Deluxe Edition. It’ll be released by BBE Music on 18th September 2015, and features twenty-one tracks from Jigmastas. For anyone interested in hip hop, Grassroots The Prologue Deluxe Edition is the perfect introduction to Jigmastas. They celebrated twenty-five years together in 2016. That’s quite a feat in the world of hip hop. Especially hip hop in the mid to late nineties. However, Jigmastas were only interested in making music. And music they made. Between 1995 and 2003, Jigmastas were at their most productive combining Moog synth riffs, sliced and diced samples and Krim’s gravelly vocals. The result is some of the most important underground hip hop to come out New York during the nineties and noughties. It features on the forthcoming Jigmastas compilation Grassroots The Prologue Deluxe Edition. It’ll be released on BBE Music on 18th September 2015. Grassroots The Prologue Deluxe Edition features twenty-one slices of Hip Hop Jigmastas style. ← LED ZEPPELIN-IN THROUGH THE OUT DOOR-DELUXE VINYL EDITION.